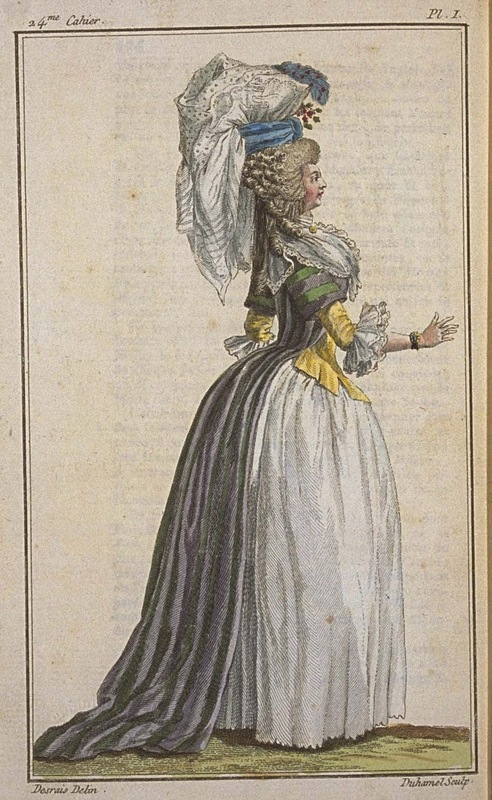 I love fashion plates. As I'll be discussing in the next episode of my podcast, problems can arise in interpreting them to get at the actual clothing worn at the time, but they can be extraordinary sources for understanding the sequences of high fashion - how and when changes happened. For the detailed timeline of fashion (and my dating of the garments themselves) in Regency Women's Dress, I pored over three decades of fashion plates in La Belle Assemblée, the Journal des Dames et des Modes, and Ackermann's Repository. You might have noticed that I've stopped doing these - it just seemed like there wasn't very much interest in the MdM/CdM, which started in the late 1780s and went into the early 1790s at least. I've proposed publishing the GdM as a coffee-table book to editors and museums and have gotten no interest back, so I'd love to self-publish it. The Bunka Gakuen Library offered me a very good discounted rate for use of the images, but due to the volume it would still be a huge chunk of change. (Doing that is my most ridiculously high Patreon goal.) I'd Kickstart it, but I don't want to do that before we have 100% delivery on the results of the Dragonrose Historic Patterns Kickstarter, since I suspect a lot of people would be turned off by that. For now, these visual sources are available here. I can't think of a real single favorite fabric I have, but I can say that the cotton madras check I used to make my "Clarissa" dress was a real winner! The yellows were bright enough to be cheery, but not glaring, and the texture was buttery soft. I only wish that I had more to make a modern sundress with. I don't mean to copy Demented Fairy, but hand-sewing really is the best tip for anyone, whether it's just basting layers together, doing binding or a piped seam, or making an entire pre-sewing-machine-period garment. You have much more control and can make much more subtle alterations on the go, without having to stop, unpick, and redo. Another is tip is to learn to work with patterns from books, whether Janet Arnold's, Norah Waugh's, Carl Kohler's, or mine. The best thing is to use them to create custom pieces for yourself in order to get the smoothest fit (I have a tutorial on that! ), but you can also take a cheap commercial pattern or a bodice block and alter it to look more like the historically accurate pattern shapes, shifting or adding seamlines and darts. Third tip! It's worth it to pay more for the right fabric, or to choose to make what fits with the fabric you can afford - gowns made in cotton that should be silk, or a heavy quilting cotton that should be lightweight, don't hang the way they should. They don't feel quite right when you're wearing them. A few years ago I started buying silk (or a good substitute) when I needed it, and it makes a big difference. Where can I find you podcast? HA costuming + podcast would = dream! I'm embedding the episodes into posts here on the blog, but you can find all (both) of the episodes on LibSyn here. It's also available on iTunes and Google Play.